The Thermo Scientific Forma High Performance Freezer offers your lab a stable environment for your laboratory reagents, biological materials and pharmaceuticals you access every day. This upright lab freezer is built with uniformity in minds, with cold wall convection cooling, and self-closing door with a positive seal. This 23-cu ft. capacity lab freezer comes preset at -20°C and is defrosted manually. Inside this upright freezer is a 1” (2.5 cm) access port. The interiors and exteriors of the forma high performance freezer are constructed with smooth scratch resistant surfaces that are easy to clean and maintain. The Thermo Scientific Forma High Performance -20°C Freezer is designed to retain temperatures and recover quickly thanks to high density CFC free insulation, directed air flow, and a hermetically sealed compressor. 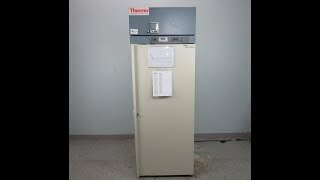 This Thermo Scientific Forma High-Performance Lab Freezer FFGL2320D19 has been thoroughly inspected and reached it's lowest temperature. All of our lab equipment comes backed with our standard warranty. Should you have any questions, please don't hesitate to contact us.